Natural Ruby has a vibrant red color and shines. Synthetic or fake Ruby is often dull: the color is "light but not bright." If Ruby is more dark red, then it might be garnet and not ruby. In terms of Ruby color, the red is more consistent along the rock. Natural ruby has very hard stones. Grind the nails or coins onto the "ruby" surface and see if you can scratch them. If ruby shows scratches, then it is possible that it is not genuine ruby. Only diamonds can scratch rubies. Check Ruby with a 10 magnifying glass. Use a jewelry magnifier or a standard microscope. If you do not have access to a high-powered magnifying device, consider asking a friend or a local laboratory. If not, just visit a jewelry shop. 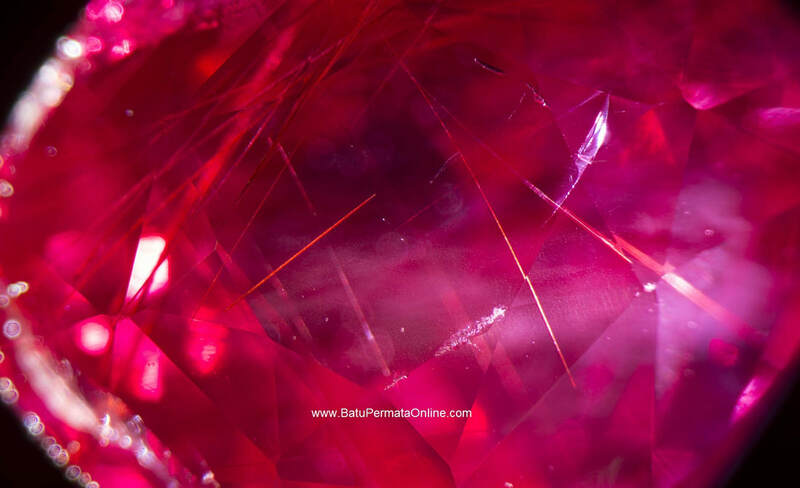 The purpose of seeing Ruby with a magnifying glass is to see the inclusions or rock fibers (Crack) in the Ruby. fake ruby ​​made in the lab is made almost always flawless. Whereas natural Ruby has a defect because it is formed by nature. If you see bubbles in any form in Ruby, it's likely that the ruby ​​is fake. Look for flaws other than bubbles. Natural Ruby has external weakness (blemishes) including scratches, holes, nicks, and small scratches. Internal weaknesses (inclusions) are categorized as: crystals (fur), negative crystals, silk, fingerprints, halos, cavities, chips, and color zones. Get to know fake Ruby types and not Ruby types. Stone commonly used as a replica of Ruby includes Garnet, Tourmaline, Glass, and composite gems. Garnet is an artificial, dark red silicate mineral. The stone is much softer (not hard) than rubies. Tourmaline is a reddish red silicate mineral. Tourmaline is a little harder than garnet, but much softer than ruby. Imitation red glass is usually cheap, but not too durable. Ruby made of glass is easy to know, because the stone is without rock fiber. Composite rubies are natural rubbish that has been combined with glass. This makes the stone bigger. Watch out! Composite rubies are often sold as natural ruby ​​as much as they don't. To make sure that the ruby ​​is natural, then bring Ruby to professional jewelry. In the end, the safest way to ensure this is to pay a professional to see the gem. He should be able to tell you whether ruby ​​is natural or not. or find out the leading jewelry stores in your city. Consider looking at reviews online before you visit a jewelry store. Check whether other customers are satisfied with the accuracy of this person's analysis. Make sure Ruby is certified to the authenticity of the stone. Licensed jewelry stores can give you official certification that your ruby ​​is natural. Ruby certificates will act as legitimate evidence if you decide to sell ruby. Your Ruby certificate for insurance purposes. If you have ever lost ruby ​​in a disaster or other mix, you will tend to receive compensation for the loss if you can prove that you lost the actual ruby. If you plan to save Ruby, keep it as a family heirloom. When your family or friends inherit Ruby one day, it will be far more valuable if certified. You will also save them from adversity through the same steps to determine whether rubies are natural.